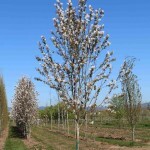 This is a narrow, upright tree with an airy, graceful texture. It makes a great street tree or in landscapes where space is limited. 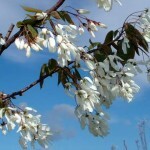 The abundant, large white flowers in spring are followed by edible black fruit. The summer foliage is bluish-green, turning to coppery orange in the fall. It has shown excellent disease resistance. 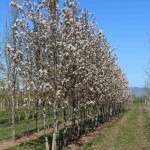 It is tolerant of a range of soils, but prefers moist and well-drained sites, and full sun to part shade.